Giddiyap.. yee haaa. Hear it is again. Illustration Friday - Theme : Leap. First thing that struck my mind when i received the theme was Joy - Happi heppi joy joy. Hence, i call mine "Leap of Joy." Illustration is done using pen-ink and watercolor. I am not of a water colour person, but i have fun doing this. Have fun, enjoy and heppi blogging. Fun and full of joy! Great illo, Rizal! glad that you like it..
Love this! 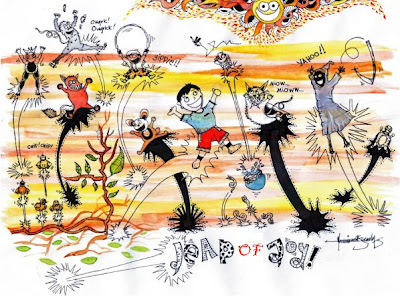 Leap of joy, I agree, such a fun illustration. i had fun doing it, though it is not my usual style..
What a fun illo! Really exciting to look at! I love it! Nice. I wish I can do the same too but my hands are justnot too good at all those art n crafts..
anyway, you are good at taking photos.. that's nice..
heppi blogging ya, and keep taking those photos of good places in KB. something that really made me smile. funny. well done rizal! i can see u have ur own style. thanks yer, err i think the dotted and strong black ink outline? my style maybe..hehe.. well, i try to go on different styles, like for instance doing watercolours, perhaps it would look different. tapi jadi camtu jugak..haha..
anyway, i like your works. You have certain styles and they are varied too..
Hahaha.. I love your illo!!! Its awesome. So happy2 mood! and i guess.. I'm hyperactive now and seeing your work!! Oh yeah.. thanx for leaving comment. Lovely, lively work that's full of joy! your works are so intricate---great details everywhere. that's your ultimate strength, i think! i like it. thanks ya..great to hear that you are on hyperactive mood. I am sure more creative juice will flow. hihi ;) I love your great details. thanks.. love your beavers too..i am happy that you like it.. Yup.. let us have a joyful ride of life..
What a happy leaping drawing, you have a unique style. Heeebat! A really fun piece with lots of interest and energy, great idea! hows bobocat? hope he/she is doing fine.. :) maybe my blackie can be friend to your bobo. Love ur style and your style is hebat too..
Love this! Your style is really fun and exciting. hope you have enjoyed your stay here.. This is full of happy energy!! masih draw secara manual and i salute you for that lah! how i wish tangan ni tak karat..
thanks for your visit and comment in my blog. Nice stuff you have here too. And so many fans! hehe..thank you2..ke mana tumpahnya kuah kalao tak ke nasi.. hihi.. oittt try laa tunjuk bakat terpendam tuu.. dulu tang belajar kan hang bukan main lagik.. lama tak tgk hang punyer artwork..hihi..
thanks, yup, i ll be keeping in touch.. love your distinctive style. Your works are great!! what a coincidence!! here, at my workplace, there is a person goes by jasmin too. Anyway, thanks ya.. heppi drawing..
so much energy! nice. and thanks for the comment. thanks ya. have a great day ahead..
Lovely - you should use watercolor more often! Guess what, my husband is going to Kuala Lumpur this October through his work. What a small world this is! This is so much fun. Great detail. It's giving me a lot of energy, looking at it and I really need energy right now. Thanks! Also thanks for stopping by my blog and for you nice and funny comments. i remembered e good old days when i was small... had a great time with frens.. it was so much fun.. just like wat ur pic says..
p/s: kan best if i could turn bck time..!! thanks for visiting. 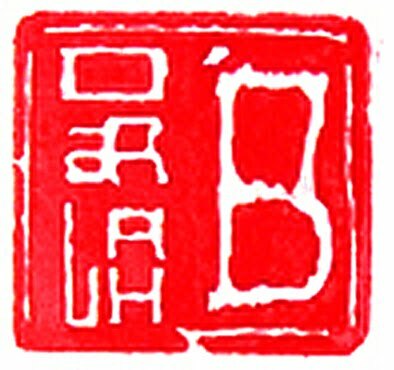 I am waiting for that sakato design sticker in my mail box now, and will definitelt post it here.. thanks..
Great to hear that your husband will be coming to Kuala Lumpur this October. You can ping me, if you like some information..
ohhhh if only i can turn back time. It was good years for me too. Now, i am just try to be as happy as i can..
dont be despair ye..am i sensing one here? thanks.. hope the smiles remain..
making one for you? i dont do the same thing twice laa.. hihi. Other theme maybe.. hihi..
this is so funny!!! i love it!!! you've got a really cool style!! !